Polished full grain leather. These leathers have passed comprehensive processes of classification and treatment. Texture may differ due to the natural marks and irregularities of the leather. Stackable armchair with upholstered seat and backrest and solid beech wood frame. Happy is a sturdy chair with a light and serene presence. Its rounded forms give versatility to integrate it into workspace, residential and public projects. 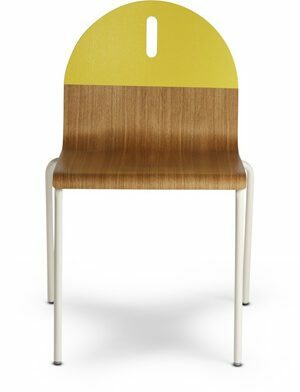 The Happy Collection consists of stacking chairs and armchairs constructed from solid beech and oak panels with optional upholstered seat and back. Dry clean or clean with foam detergents.